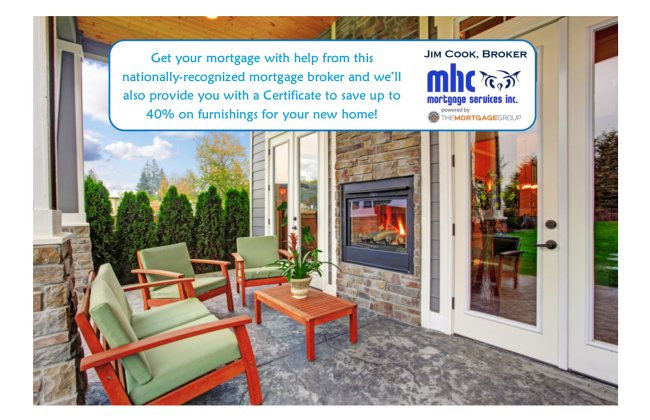 Save On Your Mortgage & Furnishings! Buying a house can be expensive. Things add up quickly! When you work with us to arrange your mortgage financing, you support local business and get national award winning expertise at the same time. With this coupon, we'll also give you a Certificate you can use to save up to 40% on furnishings and mattresses - up to 25% on appliances and electronics - from The Brick. This coupon can not be combined with any other offers. It is available exclusively through Jim Cook, Broker, MHC Mortgage Services, FSCO 11932. The Brick Certificate is only provided on approved and funded mortgage applications.